TriMet honored its best bus and MAX Light Rail operators today as well as inducted six bus and rail operators into the Million Mile Club for safe driving. Bus and MAX operators qualify for operator of the year awards based on outstanding driving records, customer service and attendance. The operators of the year were selected by their peers. 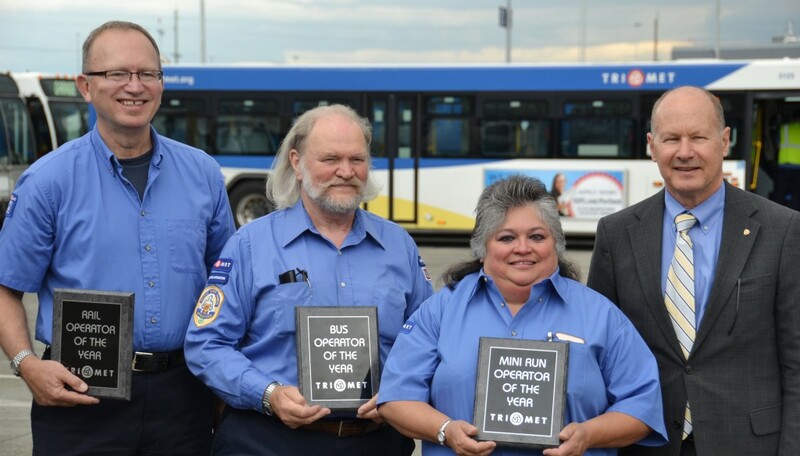 TriMet recognized its best operators of the year: (L-R) Jeffery Evans, MAX Operator of the Year; Alex Ohly, Bus Operator of the Year; Justina Carrillo, Part-Time Operator of the Year, join TriMet General Manager Neil McFarlane. Alex Ohly, who lives in Lake Oswego, has operated a TriMet bus since 1990, earning 21 National Safe Driving Awards — meaning zero preventable accidents in 21 years — and 15 Superior Performance Awards (SPA), which is earned by working at least 1,960 hours with no preventable accidents, warnings, reprimands or instructions. He’s a Master Operator, which is given to operators who earn at least 10 SPAs. Ohly also has nine straight years of perfect attendance and received three Ace awards for helping our Honored Citizens ride the bus. He said his approach with his riders is to be easygoing while using a little bit of humor. When he’s not working, Ohly enjoys spending time with his grandson and dreams about fly-fishing. Jeffery Evans, a Beaverton resident, began with TriMet in 1991 as a bus operator then moved to MAX Light Rail in 1998. He’s earned 11 SPAs and was chosen as Rail Operator of the Quarter two times — once in 2002 and also in 2015. Riders can find Evans operating MAX trips on the Blue and Red lines out of the Elmonica rail yard in Beaverton. He also briefly appeared in a Siemens commercial earlier this year. Evans previously lived in West Linn for 24 years. Outside of work, he enjoys international travel, hiking and touring on his motorcycle. Justina Carrillo, from SE Portland, has worked as a part-time, or “Mini-Run Operator” since 2003. She’s received 21 National Safe Driving Awards, which means no preventable accidents in 21 years, and six SPAs. Based out of the Center Street garage, you’ll see her on Line 33-McLoughlin/King Rd, which travels between Clackamas Community College and Clackamas Town Center, as well as Line 85-Swan Island, which travels from the Rose Quarter to the employment areas on Swan Island in North Portland. Her interests include fishing, bingo, visiting historical sites and gardening. TriMet also inducted six bus and rail operators today into its prestigious Million Mile Club, which honors operators who have exemplary safety records and give outstanding customer service. How far is a million miles? It’s like driving 172 times — round trip — from Portland to New York City and back. It takes about 29 years of safe driving to reach the milestone and more than 40 TriMet operators have achieved this honor in the agency’s 47-year history.